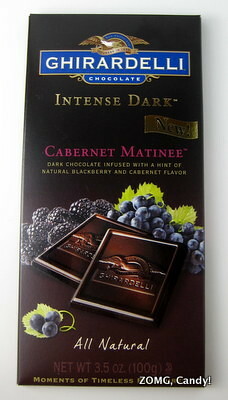 I found this Cabernet Matinee bar from Ghirardelli’s Intense Dark line at Cost Plus World Market. It was described as, “dark chocolate infused with a hint of natural blackberry and cabernet flavor”, which sounded awesome. I thought it would be wine-flavored chocolate, though it turns out cabernet could just refer to the grape. Unfortunately, the execution did not live up to my expectations. For starters, the “natural blackberry” scent was overwhelming sweet and fruity as soon as I unwrapped the bar. It was akin to being attacked by a Bath & Bodyworks saleslady. The chocolate had a nicely thick, tongue-coating melt that lingered in the finish with a light, boozy bitterness. I suppose that I was the cabernet component. The rest of the bar’s flavor profile, however, was more attack of the awfully artificial berry sweetness. 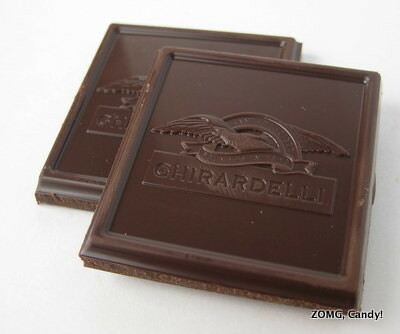 If I wanted potpourri flavored chocolate, well, I’d just eat potpourri.